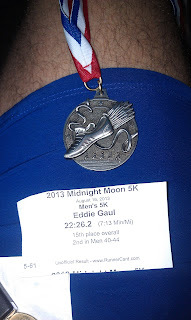 I thought the race started at 10pm, but after I signed up and was figuring out where I needed to go it turned out that the race started at midnight. For an early bird like me, that is late night living... 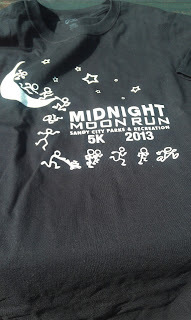 The hardest part about this race was waiting until midnight. I wasn't feeling particularly well that night. Call it pre-race nerves or maybe I was fighting something. But I felt like I was getting sick. My stomach wasn't right and I was coughing periodically. Either way, I was hoping I'd get sub 24... As many of you know I haven't been running particularly well and I've had some lingering soreness that just doesn't go away. Upon arrival, I was greeted with a mostly younger crowd. This was good news for me as the fewer "adults" there were the better my odds of snagging an age group award. My warmup went well and I actually was feeling pretty good despite the soreness. I quickly grabbed some glowsticks for my racing shoes and twisted them into my shoe laces. I also had my head lamp with me -- just in case (I only needed it to check my Garmin). 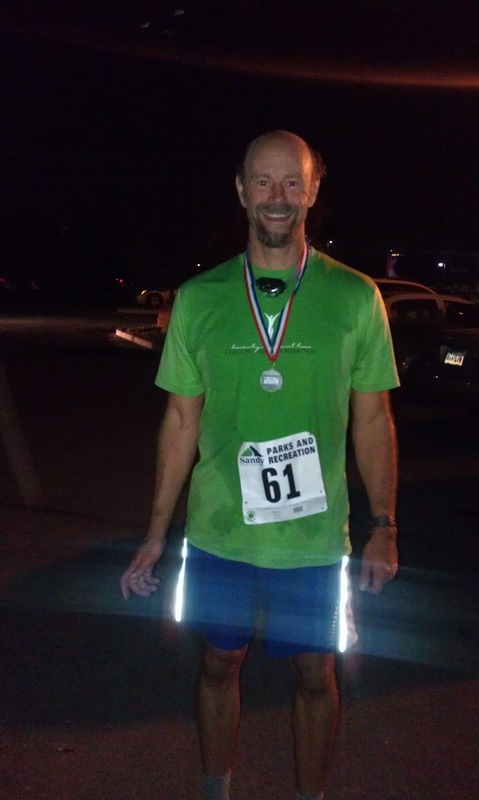 The race started promptly at midnight and I groaned as the initial quarter mile twinged my IT-bands and my stomach did a double lurch. The race beginning is mostly up hill, especially from the half mile point to just over 1 mile. There was a good 100 foot hill to climb and usually I am a fast starter in 5Ks and blow up at the end. 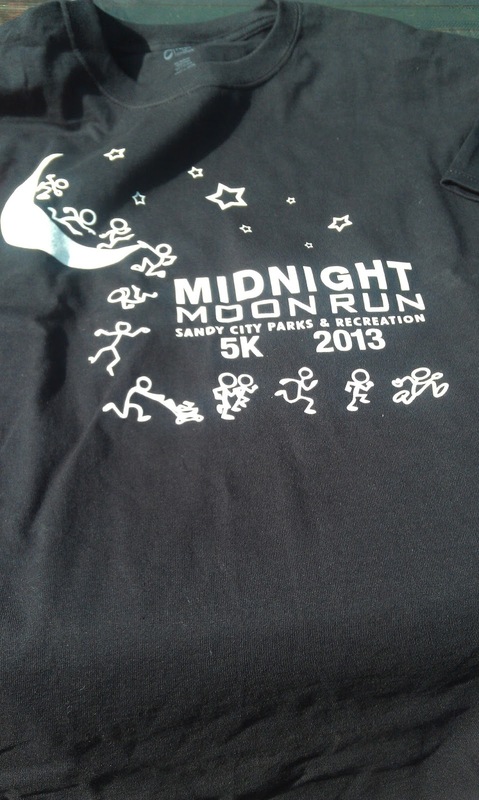 I kept my pace in check though and latched onto some guys who looked to be about my age. The course was totally mismarked. The first mile marker was probably around .8 and the 2 mile was at 1.8. I have no idea what my pace was but I felt in control and I was moving fast enough that I could see the lead group and was running with the 40-somethings. After 1 mile, the course flattens out and I was able to collect my composure again. We rounded a corner and that 100 feet climb now turned into a gradual descent (I wished at this point I had more supportive shoes, but I survived). I turned on the after burners and started reeling in people and started to drop the guys I was running with. It really felt motivating to have this second gear when usually at this point of the race I am suffering. I finished in 22:26. Before you get excited about my time, the course was obviously short. I had it at 2.97, some people had exactly 3. But this was NOT a 5K. 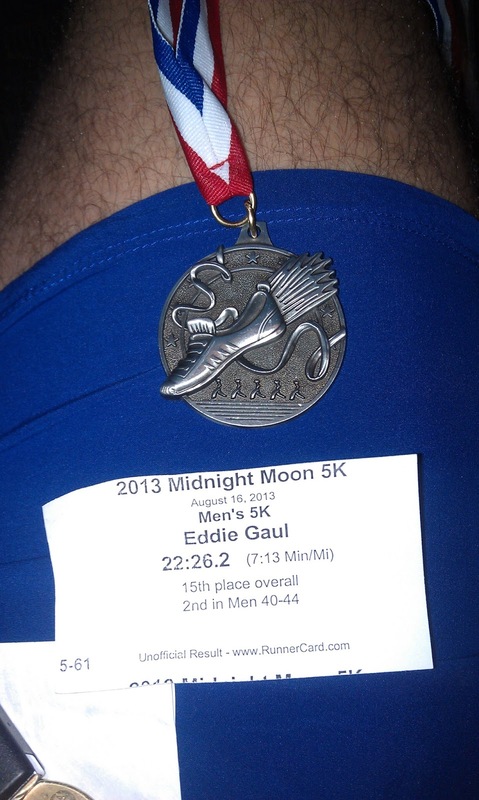 I managed to finish 15th overall male and 2nd in my age group, so I did go home with hardware. You can see the results here. I was very happy with my time and I had a LOT more in the tank at the end... Maybe the long runs and speedwork are helping me out after all..